I got myself a new notebook for my Bullet Journal. I finished the notebook I've previously used for March to July. I can't find any other good notebook that can give me the grid style I want other than Muji. The quality of their notebook is superb to be honest plus the price is reasonable. I used one of the their classic A5 in the start of 2016 and now they got a new A5 Stock that's sooooo beautiful. 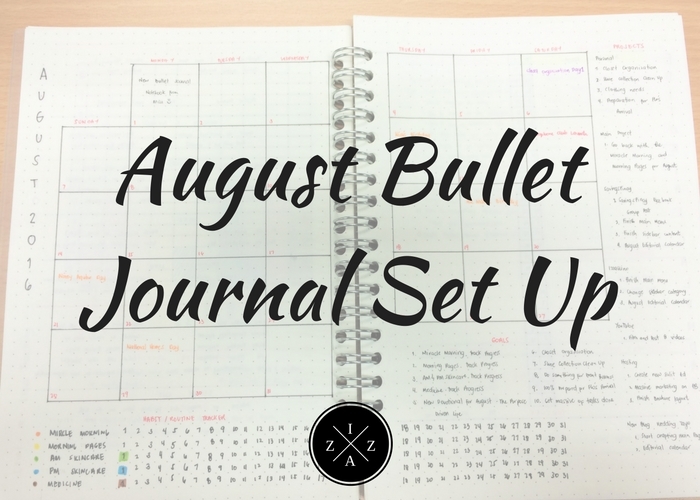 The month is not complete without me sharing how I set up my Bullet Journal for August with all the why's, how to's and tips for each entry. I strolled any other office supply and bookstore I know but found no notebook in comparable to the previous I've used. The only one that resembles the kind of notebook I want is this A5 Dotted in White Cover. I love that the cover is plastic so it won't get that much dirty. I am also okey with the quality of the paper. 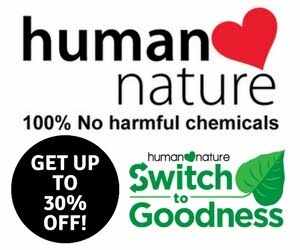 Price is 295pesos for 90 leaves. I only put August to December in my Year at a Glance since I also wanted it to act as a future log. I still use the same color coding from before. So far I filled up my calendars with all the special dates that will occur. Nothing too serious. I also transferred my Bucket List 2016 to remind me from time to time on the items I want to achieve. I kept it really simple this time and you may notice that most of my pages are very simple too. Instead of doing the same book pile style on my Books to Read I opted again for a more simple layout. I just have to write down the title of the book and author plus update my progress for each book I'll be reading. I also followed the Level 10 Life approach on my goals this 2016. I thought it would be nice to track my progress on the goals I set for this year. This is also a nice addition because I can go back to this page every now and then to refresh my mind on what matters most. With the above transferred pages said and done lets now jump on my August Bullet Journal Set Up. The best thing about my new bullet journal notebook is that its wide enough to contain big calendar boxes. I super love my August Monthly Calendar. Aside from putting special dates that I need to remember I will also write down some notes about the day in every box. I wanted to maximize my monthly calendar. I squeezed in my August Goals in the same spread so I won't need a separate page. I also separated my personal goals to my blog goals so I can regain my focus. Here every Mondays to Saturdays - As much as I wanted to blog every Monday and Saturday I fail. Still I'm proud that I've updated this blog as constant as possible. SavingsPinay every Monday, Wednesday, Friday and Saturday - I was good for the first week but fell short on my efforts. Youtube new video every week - I only posted two new videos on my YouTube channel namely Makeup Routine for Work Philippines and Bullet Journal Question and Answer. I didn't do that well on my goals for the month of July so most of my goals are carry over for the month of August. But it don't bother me. I will keep on setting goals each month and setting my intention. I pray I could keep up with all my to-do's and achieve as many as possible. 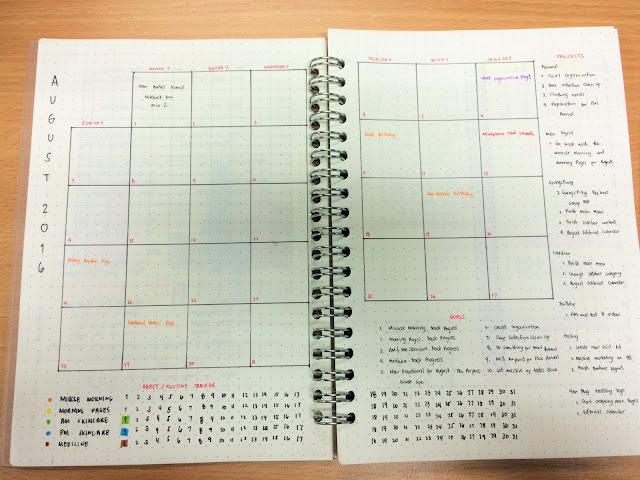 I also wrote my Projects for August on the space available in my Monthly Calendar. I only wrote the main keywords and created a separate page for Brain Dump I'll introduce later. Having this master list is important for me so I know what I have to do. I honestly have a lot of time available but I procrastinate a lot and fail to succeed on my commitments. I have a new blog/ new project I am soooo excited to launch. I wanted to perfect the launch of this blog because I see a lot of potential in it going as big as my personal finance blog, SavingsPinay. At the moment I already have the theme set up and I just need to build an editorial calendar and write a ton of content before actual launch. As you know I change my Editorial Calendar almost in a monthly basis. 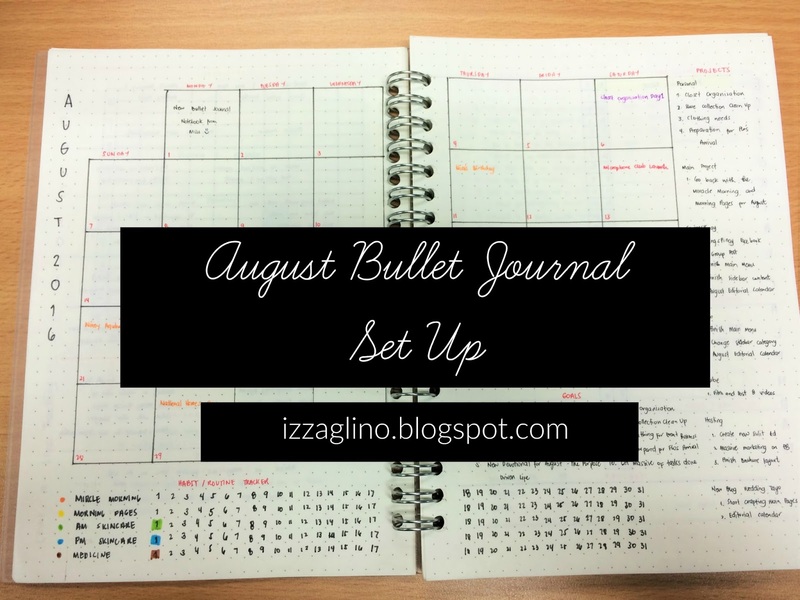 August is no exception as I tried a new layout for my content planning. Its actually a very simple layout where I put the date and days of the month in the center. I had the left side for planning the posts on SavingsPinay and the right side for IzzaGlino. At the bottom I squeezed in the videos I plan to do and to upload for my YouTube Channel. Every time I successfully published a post I just highlight it. At the next page I created a dashboard on my blog to do's, goals, stat tracker, Instagram Plan, SavingPinay Facebook Plan and a space for Notes. If I have a project item I want to elaborate or have suddenly thought of something I just use this space to write them down immediately. I plan to really use this page. I also want to quickly mention that I ditched the Weekly Page for this because I feel like I am not using the weekly page that often and I'll just be pressured to write down on it. So far I hope this Brain Dump will work as a replacement. I kept my daily pages as simple as possible too focusing on the tasks instead of the design. My Time Tracker changed too. I only track the times I start doing a task and then fill in when I'll do the next task. I also do a separate color-coding system here. I haven't done any collections yet on my new Bullet Journal but I already have a lot of idea in my mind. We'll see how things will go. That's it for my August Bullet Journal I hope you enjoyed this. 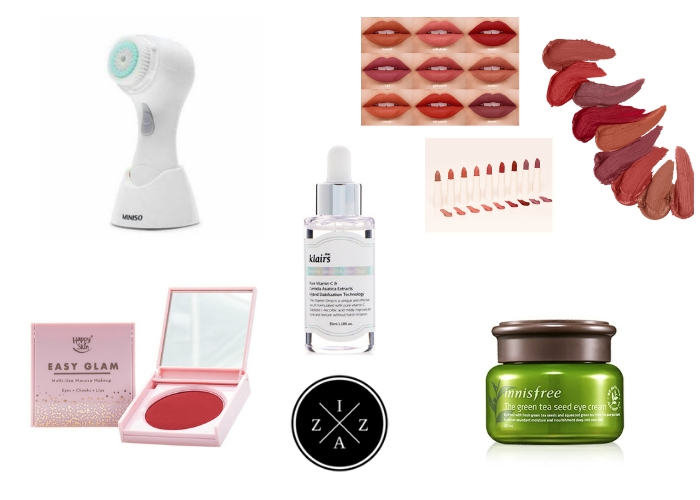 My Blogging Tools and Essentials | Where To Get Post Ideas For Your Blog | How I Use Instagram as a Beauty and Lifestyle Blogger - New!